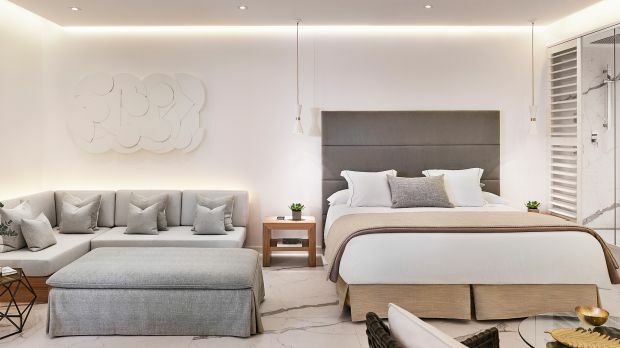 Enviar solicitação de disponibilidade com as datas desejadas para Nobu Hotel Marbella. Features a King or Twin bed, terrace, WiFi, sitting area, in-room safe, rainfall shower, Nautra Bisse, and turn down service. Features 1 King or 1 Twin bed, resort view, terrace, air conditioning and Wi-Fi Internet. Connecting room options are available. This suite offers a stylish refuge from the energy of La Plaza. Features a furnished terrace, an open-plan living space and spacious bathroom. Features 2 King bed, resort view, separate living room, air conditioning, and Wi-Fi Internet. Features four ensuite bedrooms, Jacuzzi, kitchen, air conditioning, and Wi-Fi Internet.